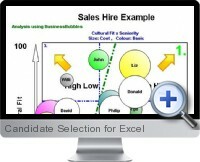 Excel Candidate selection (Business Bubbles) is a collection of analysis and visualization tools for scoring data with particular emphasis on solving candidate selection requirements from survey and questionnaire based data. The candidate selection framework combines advanced charting visualizations and color codes grid views to quickly aggregate score based reporting and identify the best possible candidates for defined attribute requirements. The solution is geared toward human resource analysis but can be employed to any type of score based data for selection analysis. Facilitates making candidate and data selection processes faster with dynamic numeric and visual analytic reporting. Applies to a wide variety of data structures including interviews, textual responses, questionnaire and any score based data. Provides flexibility to define candidate or selection members as well as categories, sub-categories and attributes with weightings for selection. Dashboard reporting combines multiple grid views and data visualization tools to understand data and scoring breakdowns. Summary performance scores show clear selection rankings with ability to perform what-if analysis and scenario testing. Survey creation includes radio buttons, number scales and percentage selection tools. Score statistics include averages, coefficient gradients, minimum and maximum etc. Instantly display league tables with break downs to show strengths and comparisons as well as charts with combinations of bar, radar, line and bubble chart types. The Excel candidate selection system functions without VBA macros, add-ins or database so is easy to setup, use and port across computers.